A reliable source for Workstation Furniture information and a resource for accessing leading Workstation Furniture and suppliers. Workstation furniture is a broad category that includes all furnishings, such as seating, tables and cabinets, needed and implemented in a given work area to promote organization, safety and productivity in industrial, commercial and domestic occupational environments. The goal of any given work station is to create an efficient space in which a worker may easily utilize, access and organize all tools and supplies required to complete a specified task. Practical, reliable and efficient workstation furniture is found in nearly every office building, warehouse, manufacturing plant, clean room, hospital and assembly line in such diverse fields as automotive, metalworking, woodworking, electronics, medical, and food and chemical processing. Depending on the task at hand, most of these work stations involve a large flat desk-like surface on which to operate machines, assemble products and write and review documents. Drawers, shelves, cabinets and cubbies are common workstation furnishings. Though some workstations are made for standing operations and have no seating, most employ a chair, stool or bench. Workstation Furniture >Workstation furniture is a broad category that includes all furnishings, such as seating, tables and cabinets, needed and implemented in a given work area to promote organization, safety and productivity in industrial, commercial and domestic occupational environments. The variability of workstation furniture means that several different materials and manufacturing processes are needed to create each unique or uniform piece. Common materials include epoxy resins, phenol resins, stainless steel, steel, aluminum, wood, marble, slate, laminate and melamine all of which may be used to create the entirety of a piece of furniture, or in conjunction with components fabricated from other materials. Material selection is directly related to the intended use of a work area as, for example, applications using or producing harsh chemicals or sensitive materials must be constructed of nonreactive materials such as titanium and stainless steel. Metal and plastic apparatus are formed through extrusion, die-cutting, injection molding and other such processes while wooden elements are sawed and sanded. The many elements are then nailed, bolted, screwed and welded together with hinges and casters carefully placed as needed for portable workbenches. 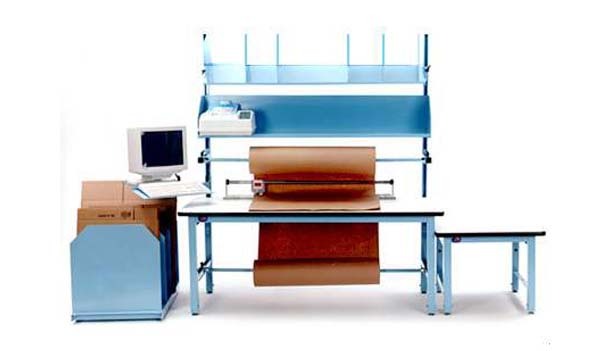 Workstation furniture and equipment is often modular and adjustable to suit the needs of changing workers and tasks. Modular workstations allow workers to configure the furniture in a manner specific to the needs of a particular job, as well as their own comfort and safety. Height, storage capabilities and power supply in the case of electronics as well as length, width, load capacity and surface type are some of the features that may be adjustable on modular furnishings. 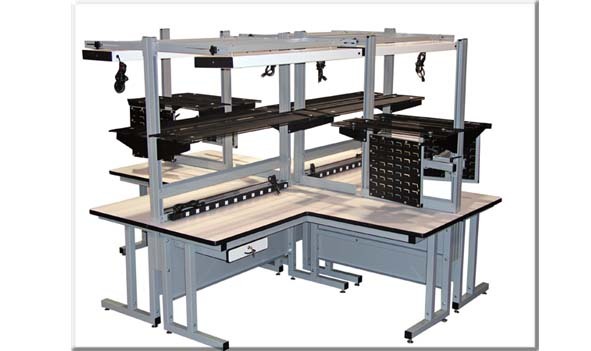 Often suppliers offer both custom work station furnishings and standardized configurations.